SACRAMENTO, California, June 4, 2017 (ENS) – As President Donald Trump pulls the United States out of the UN’s Paris Agreement on Climate, U.S. states and cities and subnational jurisdictions on six continents are filling the void with their own protective climate actions. On June 1, California Governor Jerry Brown, New York Governor Andrew Cuomo and Washington State Governor Jay Inslee announced the formation of the United States Climate Alliance, a bipartisan coalition of U.S. states committed to upholding the Paris Agreement and taking aggressive action on climate change. Ten U.S. states and eight U.S. cities that together account for nearly one-third of America’s population and GDP have pledged to achieve the U.S. Paris Agreement goal of reducing emissions 26 to 28 percent from 2005 levels by 2025. 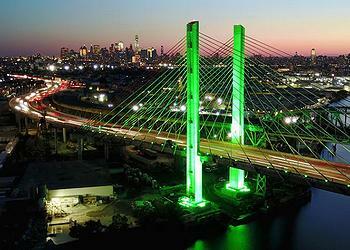 Governor Cuomo June 1 directed One World Trade Center and the Kosciuszko Bridge to be lit green in support of the Paris accord as he signed an executive order to commit New York to upload the standards set forth in Paris and announced the state’s participation in the U.S. Climate Alliance. “The White House’s reckless decision to withdraw from the Paris Accord has devastating repercussions not only for the United States, but for our planet. This administration is abdicating its leadership and taking a backseat to other countries in the global fight against climate change,” Governor Cuomo said. The United States Climate Alliance also pledged to meet or exceed the cuts in carbon dioxide (CO2) emissions from electricity generation under the Obama administration’s Clean Power Plan, which has been rejected by Trump. To extend the activities of subnational governments like California, Governor Jerry Brown is spending a week in China to expand his state’s close climate ties with that country and reaffirm California’s commitment to reduce greenhouse gas emissions. Throughout the trip, Governor Brown will meet with high-level regional and national government officials, including leaders from China’s Ministry of Science and Technology and China’s Ministry of Commerce, and sign agreements to strengthen bilateral cooperation on climate action and clean energy and technology. The International Energy Agency calls China “the undisputable global leader of renewable energy expansion worldwide.” In a report last month, the IEA forecast that by 2021, more than one-third of global cumulative solar photovoltaics and onshore wind capacity will be located in China. Governor Brown today met with top Sichuan Province officials in Chengdu and signed a new sister-state agreement focused on broadening cooperation on low-carbon technologies, environmental protection and clean energy development. 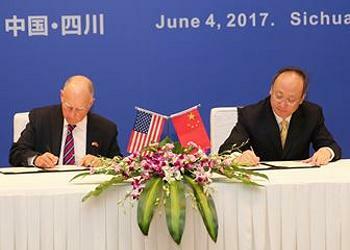 The pact, signed today in Sichuan’s capital city by Governor Brown and Sichuan Governor Yin Li, aims to bolster clean technology innovation and financing through the establishment of the California-Sichuan Clean Tech Innovation Center in Chengdu’s Tianfu New Area and development of a California-China Clean Technology Partnership Fund. The agreement also provides incubator space and market access for California clean energy and technology companies in Sichuan. This builds on the agreements California and Sichuan signed at the US-China Governors Forum in Seattle in 2015. Existing trade, education, tourism and cultural exchanges will be broadened under the new sister-state partnership. On Monday, the California governor will speak at the International Summit on New Environment Protection Technology in Nanjing, the capital of Jiangsu Province, and sign a clean technology agreement with provincial officials, to build greater regional climate collaboration and action. In Beijing later this week, Governor Brown will host the Under2 Clean Energy Forum with China’s Ministry of Science and Technology and participate in events associated with the Clean Energy Ministerial, an annual meeting of national energy ministers and other high-level delegates from nearly two dozen countries. The Under2 Clean Energy Forum expands on the Clean Energy Ministerial by gathering members of the Under2 Coalition – leaders of cities, provinces and states, businesses and NGOs around the world – to drive subnational and non-state action to decarbonize the economy and curb climate change. Under2 refers to the Paris Agreement’s stated goal of limiting climate warming to under 2°Celsius as compared with pre-industrial temperatures, the level of potentially catastrophic consequences. After just two years in existence, the Under2 coalition now includes 170 jurisdictions on six continents. These coalition members collectively represent more than 1.18 billion people and US$27.5 trillion GDP – equivalent to 16 percent of the global population and 37 percent of the global economy. Among the Under2 Coalition members are 10 U.S. states and eight U.S. cities that together account for nearly one-third of America’s population and GDP. The 10 U.S. state members are: California, Connecticut, Massachusetts, Minnesota, New Hampshire, New York, Oregon, Rhode Island, Vermont and Washington. The U.S. city members are: Austin, Los Angeles, New York City, Oakland, Portland, Sacramento, San Francisco and Seattle. The Mayors National Climate Action Agenda, a group of 187 mayors from across the country, have joined the 10 governors in denouncing President Trump’s decision to withdraw the United States from the landmark Paris Climate Accord. They have adopted the historic Paris Agreement of their own accord. “As 187 mayors representing 52 million Americans, we will adopt, honor, and uphold the commitments to the goals enshrined in the Paris Agreement,” the “climate mayors” said in a statement.